A number of fencers from Sheffield Buccaneers Fencing Club fenced in the British Cadet And Junior Championships which took place on the 1st annd 2nd October. 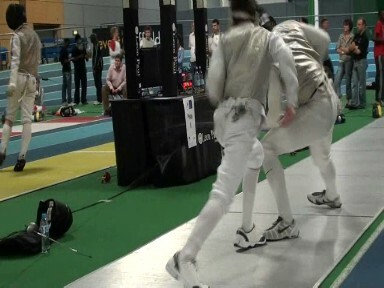 In the Cadet Mens Foil – Nathan Doherty – 14th, Alex Spencer-Taylor – 21st, Alex Wakeman – 50th, in the Mens Epee – Sam Boyle – 40th and in the Womens Epee – Hannah Boyle – 33rd. In the Junior Championships, In the Mens Foil, Nathan Doherty 16th, Alex Spencer-Taylor 58th, in the Mens Epee, Sam Boyle 64th, in the Womens foil, Rowena Johnson – 20th and in the Womens Epee, Caitlin Chang – 1st. Both Caitlin and Rowena attended the club for the first time on the Wednesday before the Championships having just started at University, Caitlin has now won a total of 11 National Championships and has been coached by Brian Matless at Harogate Fencing Club. The result that most pleas me at the weekend was Nathan’s last 16 in the Junior event, from a seeding of 51 after the pools he beat Scot Ostachini then Shaun Grundy finaly facing Christian Archer, last seasons top Cadet and scored 10 hits against Christian. After these events Nathan is 14th and Alex 20th in the Cadet rankings, both on track for a place in the British Cadet Squad at some point.